Innovative way to minimize windows - it will not minimize to the taskbar to keep your taskbar clean as you like. it will make the window smaller so you have the space you need. Easly set the window to be dark. Useful for coding, and for reading at night. This should ease the eye strains! 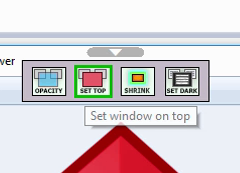 No need to manually enable every time some feature to the selected window. Replace the unpleasant white background of the window with the desktop background to get a better user experience.